This Georgian English sampler, belonging to my private collection, was worked by Ann Spence at the age of 10. She dated it “December th27 1801”. I purchased this sampler in August 2012 from Miles Griffiths Antique. 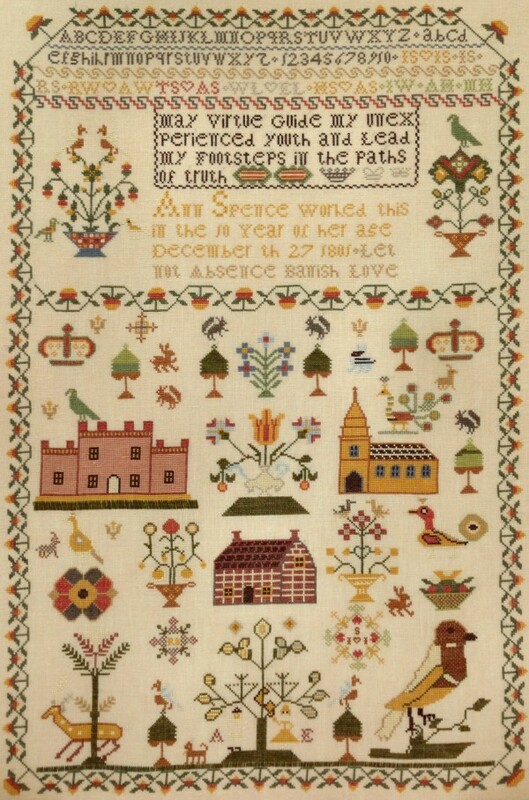 Anne Spence stitched her original 1801 sampler with vibrant silk threads and she depicted a myriad of motifs scattered throughout the sampler: crowns, birds, peacocks, parrot, squirrels, dogs, rabbits, hare, goat, stag, trees, flowers, basket with fruit or flower arrangements, cartouches with initials, and also a forest at the lower central section with a large stag and a huge parrot, the tree of knowledge with the serpent, Adam and Eve. Ann also stitched three main buildings surrounding a large central vase with flowers. At the middle right is a country church with a black tiled roof. At the opposite side is a two ranked, two-story house with two lateral extensions with one window each, in the Adam-style, with a full-length roofline balustrade, a large entry and eight chimneys. This building could possibly be a school in which she was instructed. The last building, just below the central vase, is a very simple timbered or brick English farmhouse of seventeenth century style, with only three small windows, a tiled roof and two chimneys. This could possibly be Ann’s house. A strawberry border provides a gentle frame and a strawberry band divides a shorter upper section from the other middle-inferior section. 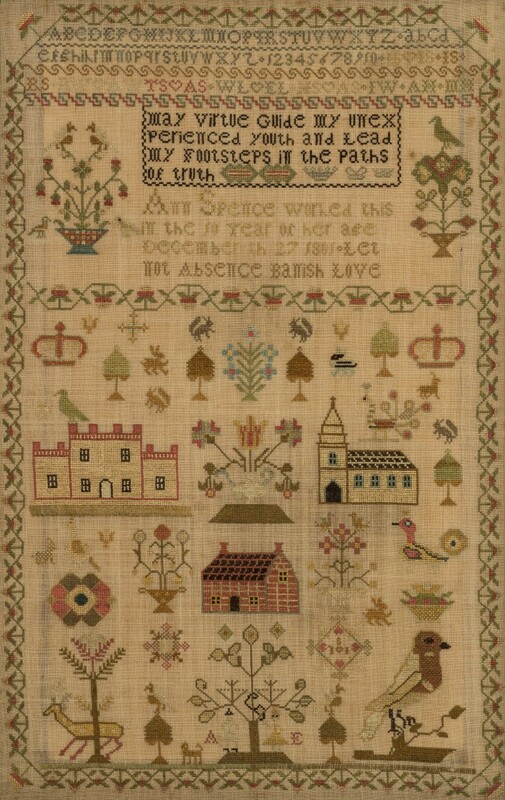 In the upper section of the sampler there are other bands, alphabets, numbers, initials with little hearts and two lovely phrases: “may virtue guide my unexperienced youth and lead my footsteps in the paths of truth” and a wedding ring motto “Let not absence banish love”. Giulia Punti Antichi designs are available through many local needlework stores. For orders please contact us.